Time to pull out the sports equipment, latex paint, and fishing line, we got ourselves a planetarium to construct! 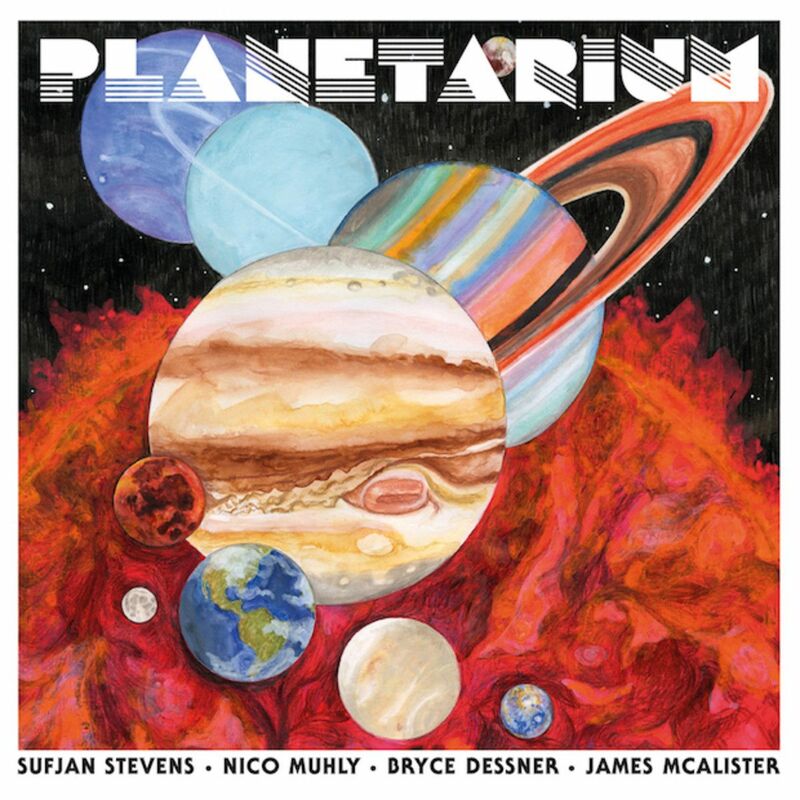 Planetarium is a collaboration between multi-instrumentalist Sufjan Stevens, composer Nico Muhly, drummer James McAlister, and guitarist Bryce Dessner. A supernova, modern art, super group, if you will. This album was inspired by our solar system and features tracks about black holes, tides, Halley’s Comet, black energy, the Sun, the Moon, the Kuiper Belt, creation, and each of the planets, including Pluto! Now let’s get to the burning question on my mind – is it off for me to say that this was a weird album to review? Running at just over seventy five minutes, and including seventeen different tracks, Planetarium takes us all over the place, both metaphorically and literally. An album chock full of ideas, it has tons of instrumentals to take advantage of, and produces epic soundscapes, while including vocals as necessary. It weaves in both the epic (Uranus, Mars, Jupiter, Black Energy) and the intimate (Venus, Mercury, Pluto, and Neptune) to good effect, but the most interesting thing to note of all of these tracks is not how they function individually, but what happens to you as you listen and experience this light show. Err, sound show. Mythology, science and astronomy dominate this soundscape. Granted it may take a few listens to really immerse yourself in it all, but each time I sat down with it, I focused on different elements. Sometimes I focused on the melody, others were about the lyrics, and still other times I just sat with my own thoughts and contemplated life. That an album about the solar system could make me reflect on my own existence is compelling. Odd that. And then we have sonic interludes like Halley’s Comet, Tides, the slightly longer Kuiper Belt, Black Hole and In The Beginning. These serve to dial down or ramp up as appropriate. Remember this is a dense album and not something to be taken lightly, but when you consider the scope and scale of it all, well then it just starts to make sense that it was organized this way. Some of my favourite moments happen on Moon, with it’s many “R2-D2” like sounds, Mars and it’s to the point thoughts on love and war, and the unfettered sexuality/lust of Jupiter. By the time we get to Earth it’s already felt like everything has happened, but not worry. Coming in at fifteen minutes, we get to experience the passage of millennia through carefully curated sequences representing formation, habitation, natural disasters, the arrival of man, and what seems like the end of civilization. This is all played tongue and cheek of course, delivered with lines like “… run Mission run, before we arrive” and ending with the more intimate Mercury. Pros: Heady and thoughtful, the talent of its members is well demonstrated on Planetarium. It gets better and better with repeated viewings, each time with a new thing to uncover. Album closer Mercury is just brilliant. Cons: Interestingly enough, the scale can be somewhat daunting to witness, but hopefully we get more harmony from the group in live performances or if they ever make another studio album. Sometimes Sufjan sounds like an auto-tuned parrot when he doesn’t need to be. Points of Interest: The group was formed way back in 2012 and Planetarium actually existed as an idea way way back then, with further get togethers solidifying the songs and setting up for a full-length studio album. This is the result of those sessions. Cosmic themes make sense as globalization has flattened the Earth, but space still remains unexplored. This is an album of abstractions, considerations, and comparative to a space opera. Maybe it won’t ever be repeated again in the history of humanity, but this record is quite a beautiful thing to behold – I just hope that it doesn’t get lost in the shuffle of 2017 releases. What else can I say about Planetarium but to listen to it for yourself creative cuties? This is a concept album through and through, and one that isn’t afraid to switch from the grandeur of the stars right down to the people on this organic jet pack hurtling through space and time. Theory or no, that’s what I think.